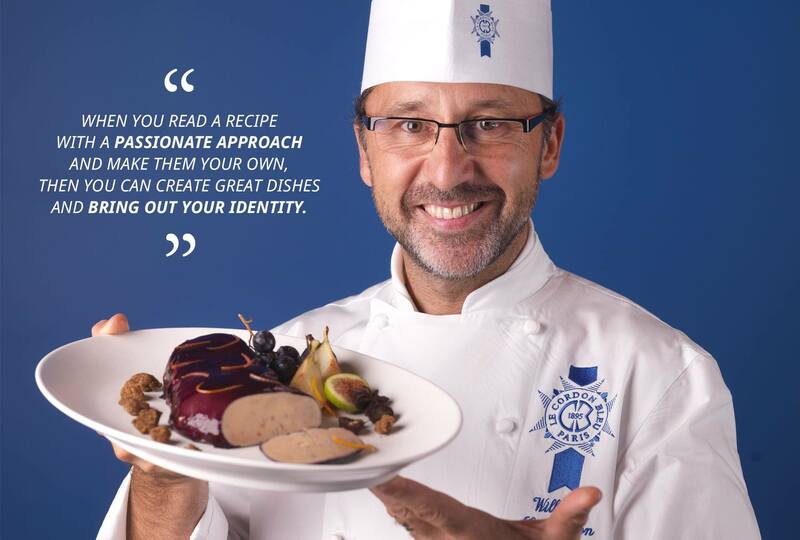 A recent arrival in the Le Cordon Bleu Paris school team, Chef Caussimon has worked in many renowned establishments. Chef’s career spanned a variety of positions from the Hilton Hotel Paris to Guy Savoy’s restaurant. We met up with him to find out more about the Chef and his passion for cuisine. Where does your passion for cuisine come from? think it comes from my grandmother who was passionate about gastronomy. She handed down her know-how and her taste for cuisine. This inspired my choice of career. What advice would you offer to a student wishing to become a Chef? To succeed, you really do need passion. At the end of the day, recipes are nothing more than a list of ingredients and a few instructions. But when you read them with a passionate approach and make them your own, then you can create great dishes and bring out your identity. That’s the advice I always give to students in class. What is the most spectacular dish you have made? A langoustine tartare with peas. It was served in three little shot glasses. I think that’s the dish I’m most proud of. It really was very beautiful - full of bright colors that worked truly well together. Given the heat this summer, my refrigerator is mainly stocked with cold drinks and vegetables from my kitchen garden. I grow tomatoes and cucumbers right in my garden. For a long time I loved cooking meat, but at the moment I prefer to work with fish. It might sound strange coming from a Chef, but I really like a good cheese with some salad. When friends invite me for a meal and I tell them this, it has the advantage of taking some of the pressure off (laughs). Sometimes, nothing beats simplicity. Do you have a favorite restaurant in Paris? That’s a tricky one but I really would recommend Les Bouquinistes, the Guy Savoy restaurant where I worked. Or something a bit more unusual: I recommend the concept store based around chocolate, Un Dimanche à Paris. Chocolate is used in every dish, from starters through to desserts: but used with real finesse in the starters and main dishes, as one would use spices. Thank you for this interview Chef. Learn more about Chef Groult, MOF Assistant Culinary Arts Director, Head of the Cuisine Department at Le Cordon Bleu Paris throug an interview. An emotionally-charged graduation ceremony took place on Friday, 10 June 2016, for our cuisine and pastry students at "Le Cercle de l'Union Interalliée"